Showing results for tags 'voters'. The results are in! March's top voters are... In 1st place, C_rex101 30 coins & 1000 tokens In 2nd place, Messenger101 20 coins & 600 tokens In 3rd place, Seansbar 10 coins & 400 tokens In 4th place, _SammyBaer 200 tokens In 5th place, Tripleskit 150 tokens In 6th place, ItsACatch22 150 tokens Congratulations, and thanks to everyone who supported PickAxis by voting! Who will be next month's top voters? The results are in! February's top voters are...  In 1st place, ItsACatch22 30 coins & 1000 tokens In 2nd place, _SammyBaer 20 coins & 600 tokens In 3rd place, Tripleskit 10 coins & 400 tokens In 4th place, code_bomb 150 tokens In 5th place, Captainspears 150 tokens In 6th place, C_rex101 150 tokens Congratulations, and thanks to everyone who supported PickAxis by voting! Who will be next month's top voters? The results are in! May's top voters are... In 1st place, Vovik_ukr 30 Coins & 1000 tokens In 2nd place, Seansbar 20 Coins & 800 tokens In 3rd place, Messenger101 10 Coins & 600 tokens Rank Player Reward 4th WolfLover1015 600 tokens 5th EkhoSonix 500 tokens 6th adalin94 500 tokens 7th ApTV 300 tokens 8th Reizvolles1234 300 tokens 9th goddante 200 tokens 10th orion12 200 tokens Congratulations, and thanks to everyone who supported PickAxis by voting! Who will be next month's top voters? The results are in! March's top voters are... In 1st place, _SammyBaer 30 Coins & 1000 tokens In 2nd place, C_rex101 20 Coins & 800 tokens In 3rd place, IntenseMoose 10 Coins & 600 tokens Rank Player Reward 4th LettieT 400 tokens 5th southparkboy13 400 tokens 6th Seansbar 400 tokens 7th mpclass3 400 tokens 8th r4ans0m 200 tokens 9th VertiMiniGolf 200 tokens 10th JasonPrimate 200 tokens Congratulations, and thanks to everyone who supported PickAxis by voting! Who will be next month's top voters? The results are in! February's top voters are... In 1st place, LettieT 30 coins & 1000 tokens In 2nd place, _SammyBaer 20 coins & 800 tokens In 3rd place, mpclass3 10 coins & 600 tokens In 4th place, angell1988 400 tokens In 5th place, r4ans0m 400 tokens And, in this month's double-feature, January's top voters are... In 1st place, _SammyBaer 30 coins & 1000 tokens In 2nd place, killaboymol 20 coins & 800 tokens In 3rd place, EnderMist_123 10 coins & 600 tokens In 4th place, joncraft92 400 tokens In 5th place, mpclass3 400 tokens Also, the following lucky players won some coins from the recent drop parties hosted by SheTolerance and ZTolerance! Player Reward ScribNyan 30 coins KittyxLover 20 coins rampage1779 10 coins EnderMist_123 10 coins C_rex101 10 coins LettieT 5 coins JazzyHorseLover 5 coins shadowpyrolily 5 coins Southparkboy13 5 coins Congratulations, and thanks to everyone who supported PickAxis by voting, as well as everyone who made the recent drop parties a huge success! Who will be next month's top voters? The results are in! December's top voters are... In 1st place with 141 votes, Mighty_Jak $30 store credit & 1000 tokens In 2nd place with 129 votes, coolpig5342 $20 store credit & 750 tokens In 3rd place with 98 votes, kgindaheezy $10 store credit & 500 tokens Rank Player Reward 4th gavinater711 300 tokens 5th Bill 300 tokens 6th BnJbirds 200 tokens 7th Benpenguin2 200 tokens 8th _Casanova 200 tokens 9th vertigolf 200 tokens 10th MCPlaying_Goalie 200 tokens Congratulations, and thanks to everyone who voted for supporting PickAxis! Who will be next month's top voters? The results are in! January's top voters are... In 1st place with 151 votes, Malsamatic $30 store credit & 1000 tokens In 2nd place with 142 votes, vertigolf $20 store credit & 750 tokens In 3rd place with 130 votes, Mighty_Jak $10 store credit & 500 tokens Rank Player Reward 4th BnJbirds 300 tokens 5th gsdcs29615 300 tokens 6th kgindaheezy 200 tokens 7th ScribNyan 200 tokens 8th KnightDraakon 200 tokens 9th collinsohn 200 tokens 10th oAPEXoK3ZIA 200 tokens Congratulations, and thanks to everyone who voted for supporting PickAxis! Who will be next month's top voters? The results are in! February's top voters are... In 1st place with 140 votes, Pinball7wiz $30 store credit & 1000 tokens In 1st place with 140 votes, The12thDr $30 store credit & 1000 tokens In 3rd place with 138 votes, gsdcs29615 $15 store credit & 700 tokens Rank Player Reward 4th Mighty_Jak 300 tokens 5th ZTolerance 300 tokens 6th joncraft92 300 tokens 7th ScribNyan 200 tokens 8th vertigolf 200 tokens 9th coolpig5342 200 tokens 10th KnightDraakon 200 tokens Congratulations, and thanks to everyone who voted for supporting PickAxis! Who will be next month's top voters? The results are in! May's top voters are... In 1st place with 152 votes, ZTolerance $30 store credit & 1000 tokens In 1st place with 152 votes, vertigolf $30 store credit & 1000 tokens In 3rd place with 136 votes, RoryTheRoman94 $10 store credit & 600 tokens Rank Player Reward 4th Sullear 400 tokens 5th Bill 400 tokens 6th UnicornHorn 200 tokens 7th Pinball7wiz 200 tokens 8th Meg1626 200 tokens Congratulations, and thanks to everyone who supported PickAxis by voting! Who will be next month's top voters? The results are in! July's top voters are... Tied in 1st place with 155+ votes, Ebed_Melek $30 store credit & 1000 tokens Tied in 1st place with 155+ votes, Sullear $30 store credit & 1000 tokens In 3rd place with 131 votes, ZTolerance $10 store credit & 600 tokens Rank Player Reward 4th RoryTheRoman94 400 tokens 5th ScribNyan 300 tokens 6th Untypical 300 tokens 7th Pinball7wiz 300 tokens 8th skarzs 200 tokens 9th gsdcs29615 200 tokens Most time spent playing in July Ebed_Melek 1000 tokens Congratulations, and thanks to everyone who supported PickAxis by voting! Who will be next month's top voters? The results are in! August's top voters are... Tied in 1st place with 155+ votes, Ebed_Melek $30 store credit & 1000 tokens Tied in 1st place with 155+ votes, Sullear $30 store credit & 1000 tokens Tied in 3rd place with 105 votes, pastaman12 $10 store credit & 600 tokens Tied in 3rd place with 105 votes, Untypical $10 store credit & 600 tokens Rank Player Reward 5th Pinball7wiz 300 tokens 6th ZTolerance 300 tokens 7th Trixter313 200 tokens 8th killaboymol 200 tokens 9th Alice_Arcana 200 tokens Most time spent playing in August Trixter313 1000 tokens Congratulations, and thanks to everyone who supported PickAxis by voting! Who will be next month's top voters? The results are in! November's top voters are... In 1st place, mpclass3 30 Coins & 1000 tokens In 2nd place, RoryTheRoman94 20 Coins & 800 tokens In 3rd place, Adensem911 10 Coins & 600 tokens Most time spent playing in November mpclass3 1000 tokens Congratulations, and thanks to everyone who supported PickAxis by voting! Who will be next month's top voters? The results are in! December's top voters are... In 1st place, Adensem911 30 Coins & 1000 tokens In 2nd place, RoryTheRoman94 20 Coins & 800 tokens In 3rd place, _SammyBaer 10 Coins & 600 tokens In 4th place, mpclass3 500 tokens In 5th place, skarzs 400 tokens Most time spent playing in December _SammyBaer 1000 tokens Congratulations, and thanks to everyone who supported PickAxis by voting! Who will be next month's top voters?